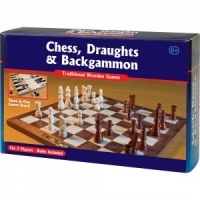 Dominoes is one of the most popular games to be played in pubs and clubs throughout the UK. 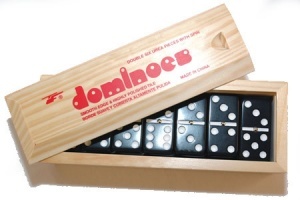 This box contain 28 full size, double six dominoes with spinners. Available in black or ivory. Please select your preferred colour from the dropdown menu above. 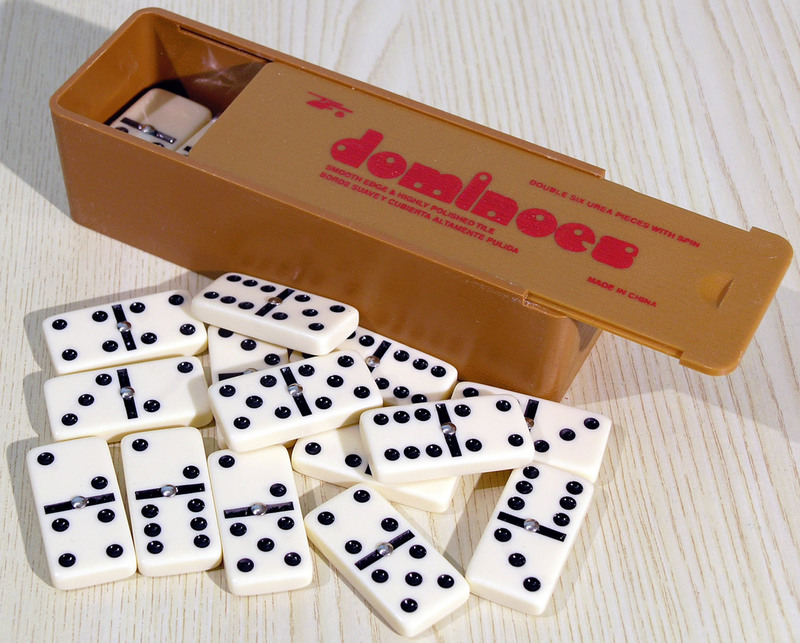 This is just one of many variations of the game of dominoes. Before play begins, all dominoes are turned facedown and mixed up. Each player draws five dominoes and stands them on edge so the other player can't see the domino faces. The remaining dominoes become the draw pile. Players draw a domino from the draw pile and the player who draws the highest double domino places it in the middle to begin play. If no double is drawn, all dominoes are returned to the centre, mixed up and then redrawn. Once the first double has been laid, play moves to the left and the second player tries to match one of their dominoes to one end of the double. 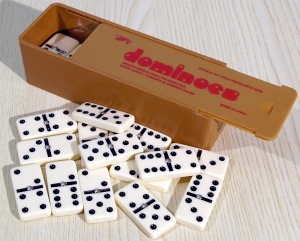 For example, if the first domino played is a double four, the next player may add any one of his dominoes that contains four spots on one end. The next player can then play to the double four, or the second domino played. Blank sides must be matched to other blank sides. Only one domino may be played per turn; dominoes are played length-wise rather than at right angles, except in the case of a double as shown in the diagram, at any open end of a row. If a player can't go, they must draw a domino from the draw pile until they can go. Should they draw the last domino and still not be able to play, they must pass and try again on their next turn. A player must play a domino if they are able to do so. Doubles are always placed crossways to the domino they are matched to, thereby giving two new directions in which to place dominoes. Play continues until one player has used all their dominoes or until no-one can play. If no further play can be made and all dominoes have been drawn, the player with no dominoes, or with the least number of points (spots) on his remaining dominoes, wins the round. He subtracts the total of his points from the total of each of his opponents points and scores the balance of points from each. 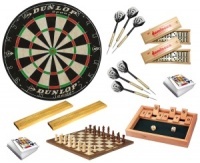 Rounds continue until one player scores 100 points. The game is won by the first person to score 100 points.